Fox Labs Law Enforcement Strength Pepper Spray, 1.5 oz. Fox Labs Law Enforcement Strength Pepper Spray, 2 oz. The hottest pepper spray used by police and military forces. Most pepper sprays are between .5 to 2 million Scoville heat units. 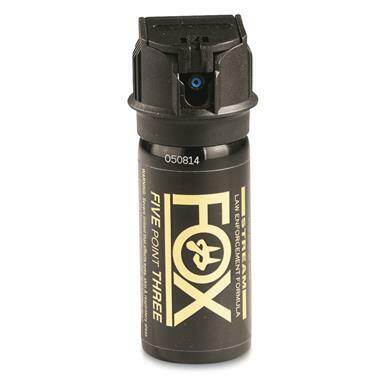 Fox Labs Pepper Spray is non-blistering and refined to an outstanding 5.3 million Scoville heat units. That is 2.6 to 11 times stronger than most other pepper sprays. That's a whole lot of heat packed into this piece. So go ahead and check this survival tool off your bug out bag list. Emergency preparedness has never been so easy and affordable! Cans contain Ultra Violet Dye. With flip-top safety. Protect yourself and order today! Fox Labs Law Enforcement Strength Pepper Spray, 1.5 oz. is rated 4.8 out of 5 by 21. Rated 5 out of 5 by officer Bob from Very Effective I carried Fox in a prison, and believe me it does the job. Rated 5 out of 5 by ThePostman from Just the right size. 2oz. size is perfect to take with you on your daily walk for animal or people attacks. Did not use it yet, but confident it will work as stated. Made in USA. Service from Sportsman Guide was great as always. Rated 5 out of 5 by Biologist Bob from Not sure yet Nice container. I'll let you know further after I spray it in some thug's face. Rated 5 out of 5 by Sammy baby from Perfect Size This is my second review of both 4 oz and 2 oz. Fox pepper spray canisters. I like this size canister because it can be easily carried in cargo pocket,jacket , in vehicle, back pack, etc. Easily concealable and spring safety guard covering top is great as not to accidentally discharge. The 4.oz. version held up well after 2 years ,tested with powerfull propellent . This one should be fine also even if not used for long period of time. Rated 5 out of 5 by RoanokeMarc from Great price, works great on meancing dogs Like insurance and a fire extinguisher, you hope to never need this. We are in the country and have neighbors with dogs that let loose. 2 particularly nasty ones chase cars and come after you if you are on foot or with your pet. This spray stops them in their tracks. After the second incident, they don't come near us. Protect you and your loved ones! Stop assailants before they get within reach!